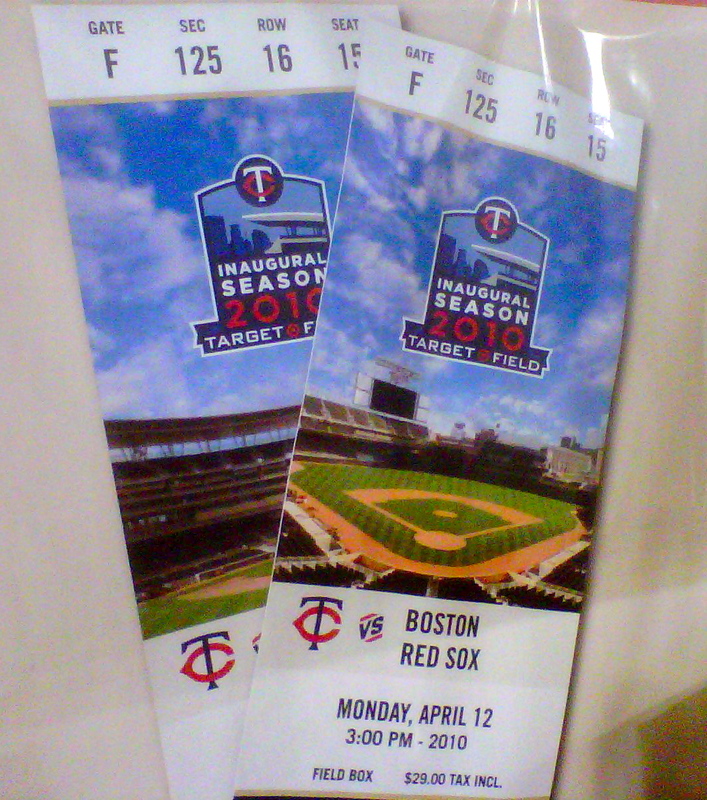 The first real game at Target Field is now just over 70 days away. As the days slowly pass, reality is beginning to set in that the Minnesota Twins will really have their own ballpark and be back outdoors next season. It seems like just yesterday that the team was breaking ground on the construction site and fans were looking at simple renderings of what the future park might look like. 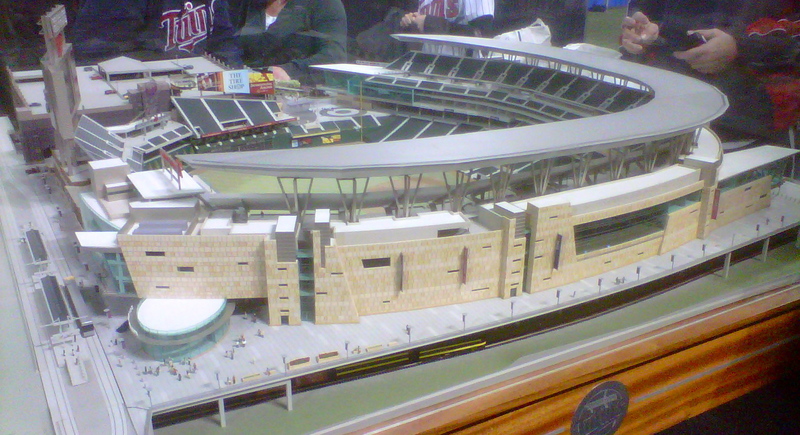 Those renderings are now a direct resemblance of Target Field. All around baseball, slugger Jim Thome is regarded as the ‘nice guy’. He’s well respected for his involvement in the community, his leadership in the clubhouse, and his general likability by opposing teams and players. For 16 seasons, Thome has been the Twins’ nemesis. 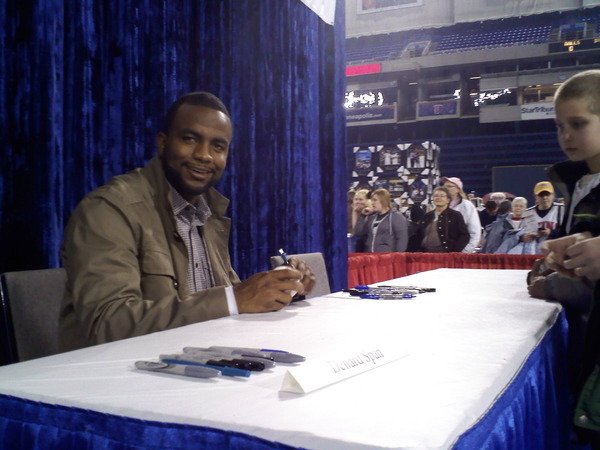 First the five-time All-Star spent 12 seasons with the Cleveland Indians, and most recently he spent four seasons with the Chicago White Sox. Thome has hit 57, count them 57, homeruns against Minnesota, with the notable one helping Chicago capture a division title over Nick Blackburn and the Twins in 2008. After being the bully for 16 years in the American League Central, the Twins are now trying to add the powerful lefty to their own roster in hopes that he’ll turn the tide on Cleveland, Chicago, Detroit and Kansas City. Thome makes sense for the Twins, a team in need of a powerful hitter off the bench, and a team still searching for a fourth outfielder. No, Thome won’t be patrolling the outfield anytime soon, but he would indirectly affect the situation. With Thome on board, the Twins would add a powerful pinch hitter off the bench, and a more than capable designated hitter against right-handed pitching. While Delmon Young, Denard Span and Michael Cuddyer are plugged into the outfield, the Twins currently have Jason Pridie as their fourth outfielder. Thome would allow the team to shift current designated hitter Jason Kubel to left field and Young to the bench when necessary. Outside of Minnesota, the White Sox and Rays are still in on the 39-year old veteran. Chicago is leaving the choice up to manager Ozzie Guillen, and he’s expected to make his decision in mere hours. If his former team passes, Thome could choose his 2010 destination by the end of the week. It took only one day for the Minnesota Twins and their eight arbitration eligible players to agree to terms. 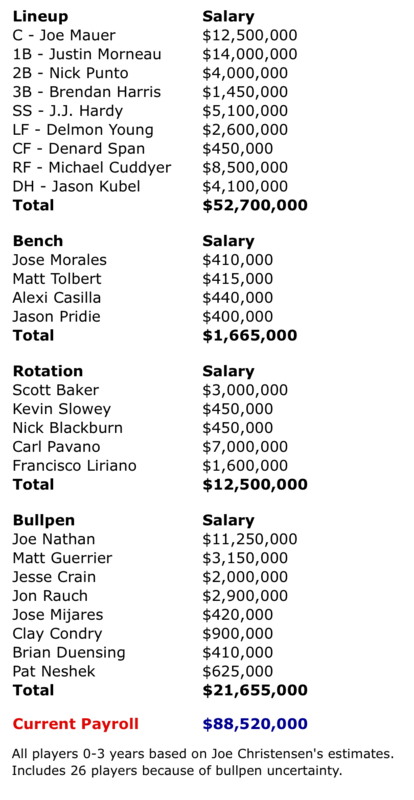 After all players filed by the deadline last Friday, the sides exchanged offers on Tuesday and agreed to contracts for the 2010 season by the end of the day. Carl Pavano signed for $7 million, J.J. Hardy for $5.1 million, Matt Guerrier for $3.1 million, Delmon Young for $2.6 million, Jesse Crain for $2 million, Francisco Liriano for $1.6 million, Pat Neshek for $625K, and Brendan Harris agreed to a two-year, $3.2 million contract. On the day, the Minnesota Twins committed an additional $23,475,000 to their payroll for next season. 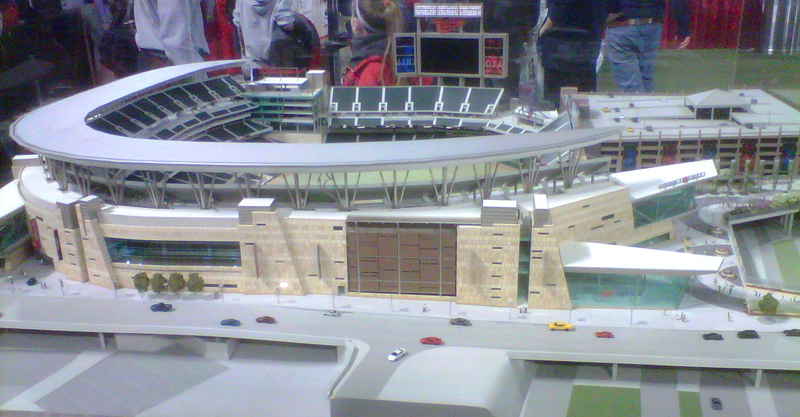 In addition, they took another huge step toward a $90 million payroll for their first season at Target Field. Currently at about $88.5 million according to rough estimates, the Minnesota Twins may have a small amount of money left to spend in the coming weeks. With reports that the Twins offered Jarrod Washburn a one-year, $5 million contract two weeks ago, there are indications that the organization could approach $95 million if the situation is right. With second base, third base, and the fourth outfield spot uncertain, it is still very possible that the Twins could make another addition before the club reports to Fort Myers, Florida in four weeks.